I thought it was especially cool how the fest made sure to get almost every comic up in a variety of rooms. Neat to see people who usually do small shows get a chance to perform in front of hundreds of people, ya know? Best sets of the fest that I saw: Maria Bamford, Pete Holmes, James Adomian, and Amy Schumer. All killers. And I think my fave venue was the kooky Eagles Lodge, an Elks Lodge type place complete with ancient Bingo players in the lobby. I opened my set there by yelling "B-24" over and over again. Also, the fest did a good job of keeping comics stocked with food, drinks, rides to/from venues, and stuff to do during the day. And of course it helps that Portland is pretty damn great. As a fan of Portlandia, it's tough to wander the city without constantly thinking of the show. I walked past a vintage mailbox that had "book exchange" printed on the side and a guy on a bike rode up, dropped off a book, and took another one. Precious! Also, strip clubs, food trucks, trees, and rain. Ya know, Portland. Now I'm up in Seattle. Did a show up in Bellingham (small town 1.5 hrs north of Seattle) last night. Afterwards a gal came up to James Adomian and was trying to tell him where the gay bar in town is. He said he wasn't interested. The gal's friend said she understood because "the gay bar in Bellingham, WA is really just the place where straight people go to dance." Ha! I love it when an audience member has the line of the night. More shows in Seattle tonight and then off to Victoria, BC to do shows for Canucks this weekend. Details here if you're in the area. 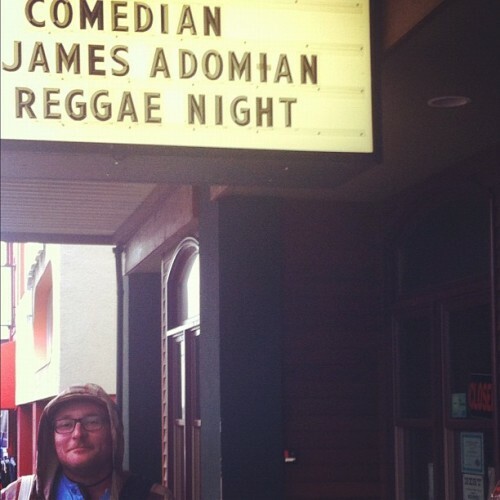 Comedian James Adomian Reggae Night! We all got dreadlocks before the show.